Sausage is something most home cooks don’t even try because of the amount of work it needs. You need to grind meat in perfect proportions. You need to keep everything on ice. You need to stuff the sausage meat into casings. It’s a big hassle, requiring some special equipment and a lot of time. And the clean-up is a pain. Here’s an easy method I can slap together in minutes. I use ground pastured Berkshire pork for this, but any good quality ground pork will do. Combine all the ingredients in a bowl and mix well. Place the bowl in the fridge for at least 15 minutes to let the meat rest. If you’re not sure of the seasonings, break a little piece of the sausage off and fry it in a pan to taste it. If you like what you have, fry away. If not, season the meat before making patties. Heat a pan over medium-high heat and swirl a little oil or pork fat to coat. 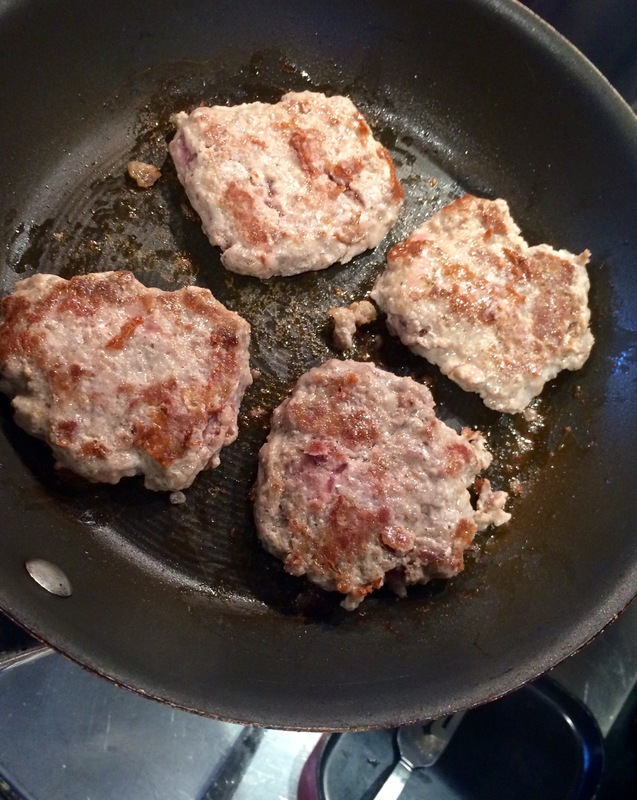 Form the sausage meat into 2-inch patties and place them in the pan, cooking them all the way through, about 4 minutes a side, until they’re golden brown on both sides. Sausage, like bacon, is magical. It contains but a handful of simple ingredients. But when you mix them together, they form a truly flavorful food that is far more than the sum of its parts. What has always kept me from trying to make my own sausage at home was that it seemed like a very complex process, from mixing and grinding all the ingredients, to stuffing them into casings. But then I thought about it: most of the time when I cook sausage at home, I remove the casings beforehand anyway…so why put them into casings in the first place? Once I realized I didn’t have to deal with the hassle of stuffing casings, making sausage became something I knew I really wanted to try. The best book for anyone interested in making their own sausage, bacon, salami and more is called “Charcuterie,”by Michael Ruhlman and Brian Polcyn. It shows you step-by-step how make these meaty creations, and I used their basic garlic sausage recipe to make my first-ever batch, though I did add a tweak of my own.This recipe makes a 5 lb batch of sausages…enough for you to pig out for some time, and still have enough to share with your friends. Cutting the pork and bacon pieces into small cubes that grind more easily. Ingredients:A total of 5 lbs of pork, containing 25% to 30% fat. I used lean pork loin, and then added pork fat to bring the fat level to around 30%. My special tweak was to include a half-pound of my home-made bacon (a future blog), to add some salt and smoky flavor. It’s important to use at least 25% fat (or you’ll have dry, tasteless sausage) and I keep the meat as cold as possible at all times, so that the fat doesn’t break down or melt. I chop the meat and fat into small-sized bits that will be easier to grind…place them in a bowl, adding the salt, pepper and garlic. I mix the ingredients really well, place in a Ziploc bag, and store in the refrigerator overnight to chill and marinate. The next day, I set up the grinder, keeping the meat in the fridge until the last minute. I have a Kitchen Aid mixer with a grinding attachment that does a great job of grinding the sausage. Using the smaller die, I grind the contents of the Ziploc, letting the ground meat fall into a bowl that sits in ice. Once all the meat has passed through the grinder, I place the meat in the bowl of the mixer and, using the mixing paddle, mix the meat slowly for about 1 minute. I then add the 1 cup of cold Pinot Noir and mix for another minute, on medium. If the sausage meat is sticky, I know I’ve reached the stage where it can go into casings–after I fry up and taste a small sample piece to make sure all of the seasonings are just right. If you do plan to use casings, keep the sausage meat in the fridge until you’ve set your casings equipment up. As I said, I totally skip the casings part of the equation. So once the sausage meat has chilled for a bit, I roll them into small meatballs, placing the meatballs on trays lined with non-stick aluminum foil for easy removal later. These trays of meatballs go into the freezer, and once the meatballs freeze up, I can place them in freezer bags and properly store them. I’ve also made sausage patties using a mold I have for beef sliders. Any shape will work. 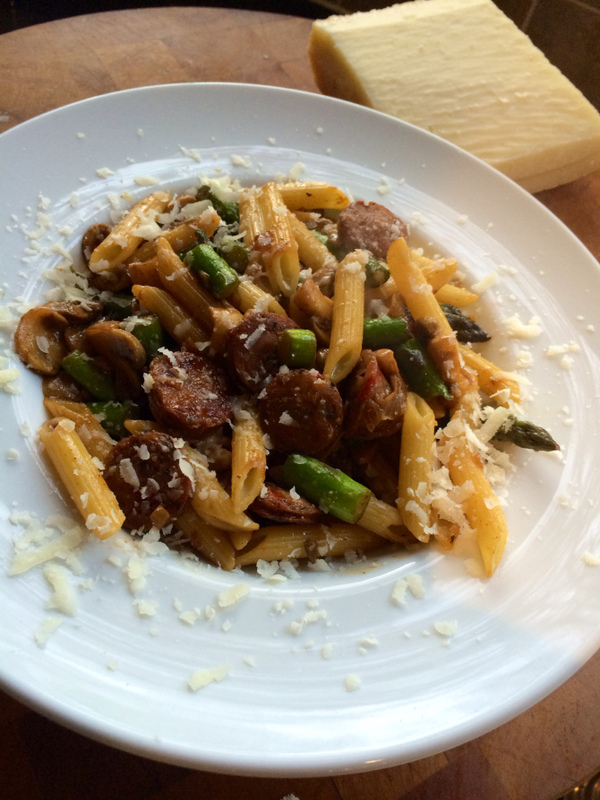 Once you’ve made your own sausage, you will never settle for store-bought again. Knowing every ingredient that goes in…knowing the quality of the meat you’ve used…binding (and flavoring) with a quality red wine instead of simple water…it makes an incredible difference!